Have you tried whitening and haven’t gotten the result you want? Are you unhappy with the shape or size of your teeth? Do you want a more attractive smile that improves the color, size and alignment of your teeth? Do your current teeth stain easily or are chipped from years of normal function? If you answered yes to any of these questions, porcelain veneers may be the best solution for you! 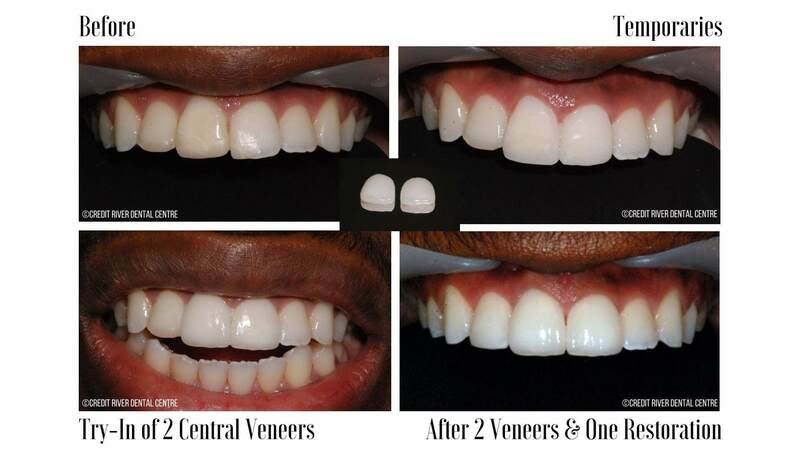 Veneers are beautiful custom-made super thin porcelain that’s permanently bonded to a tooth. While it’s true that many celebrities have chosen to have this cosmetic procedure performed, here at Credit River Dental Centre in Mississauga, veneers have also been a very popular treatment option for pretty much anyone you can think of-your friends, relatives, neighbours, students, bartenders, trades people, you name it- basically anyone who would like a more attractive smile! Porcelain veneers can enhance and improve your appearance in a number of different ways. First of all, veneers can alter the color or shade of your teeth if you are not happy with it. Unfortunately, not everyone develops ultra white teeth. Some people may find that eating certain foods or drinks may discolour their teeth and may find that bleaching or tooth whitening is not giving them the results they were expecting. Porcelain veneers can help to address this issue. Because the porcelain is so thin they feel very much like your natural teeth and once bonded to your tooth, they are not only extremely strong but they look just like your natural teeth as well because of the way they allow light to reflect and pass through the porcelain. Another issue that porcelain veneers can help with are patients that are unhappy with the size or shape of their teeth. Even small gaps between the teeth can be fixed with porcelain veneers. Very little or sometimes even NO tooth reduction is required to prepare the tooth for the porcelain veneers. Porcelain veneers have the moniker of ‘Instant Orthodontics’ because they have the ability to improve the appearance of your teeth in instances of minor crowding or spacing. Even teeth that are worn down can be made to look the way they used to. Unlike braces or Invisalign, porcelain veneers can achieve these desired results in a matter of weeks as opposed to months or years. Using porcelain as a restorative choice offers many advantages. Because the veneers are processed in a laboratory, the colour choices are extremely extensive and can be matched to the patients’ desire. Some patients favour extreme white whereas some patients opt for something a little more natural looking. We will work with you by evaluating a number of different factors to help you choose the right shade for you and your lifestyle. Another advantage of using porcelain is that porcelain is extremely durable and highly resistant to staining or chipping. Because the porcelain is shaped in a lab, there is a lot of control over the size and shape and the ceramicist will sculpt the veneer in a way that will fit your smile the best. As mentioned before, porcelain reflects light in a manner very similar to your natural teeth which results in esthetics that are unmatched by other restorations or materials. 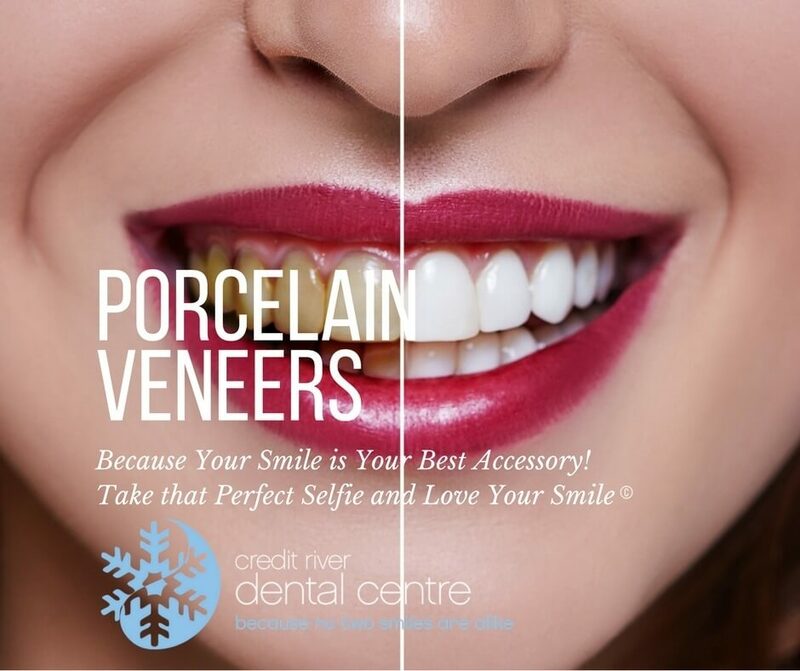 Porcelain Veneers Mississauga are a very conservative treatment option for improving a variety of minor cosmetic issues. If you have a simple imperfection that is tarnishing your smile, ask Dr. Lee about porcelain veneers. To make sure your porcelain veneers Mississauga stay brilliant keep up with your daily flossing and brushing, and see your hygienist a minimum of twice a year. A gorgeous new smile is waiting for you at Credit River Dental Centre!